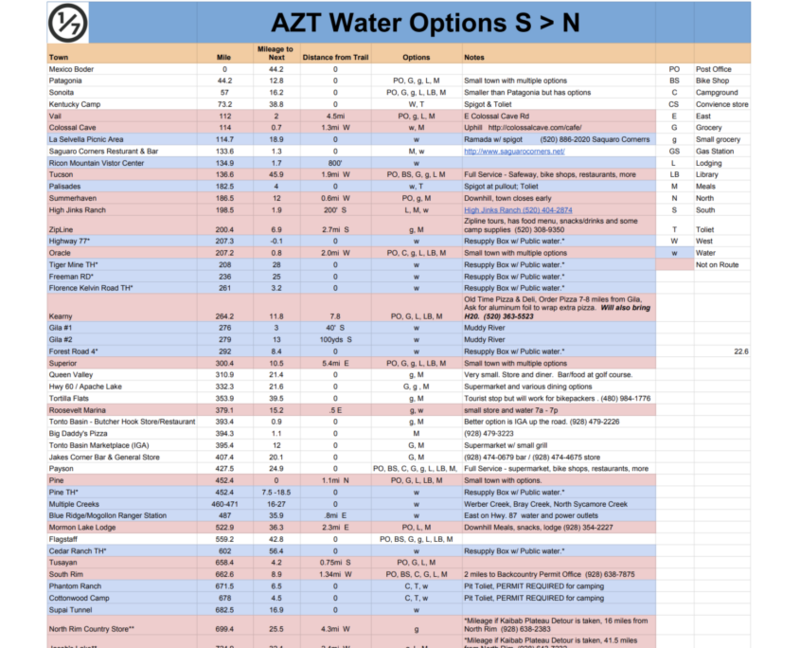 YOUR RESUPPLY HOW TO FOR THE AZT. Please consider taking a few minutes to take our survey. 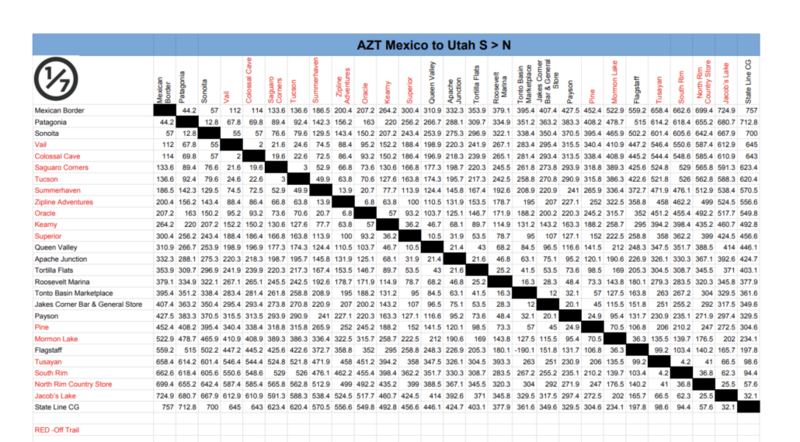 The goal is to collect data to improve our guides and also help future bikepackers in preparing for the AZTR. Thanks for your consideration! 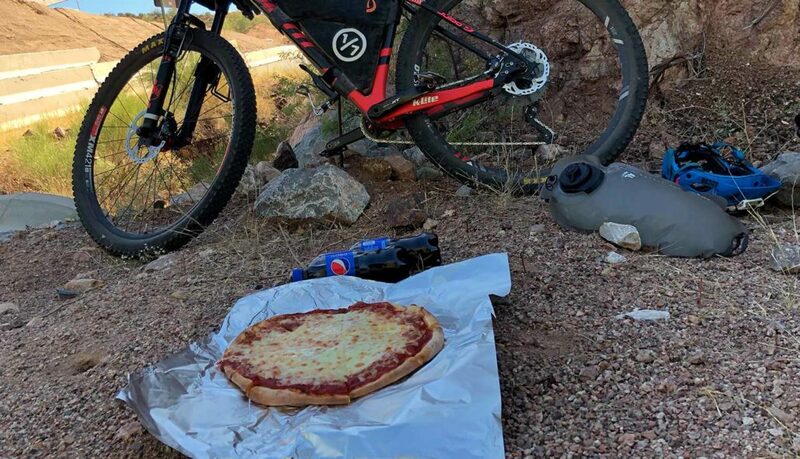 When it comes to Resupplying on the Arizona Trail and setting up an Itinerarythere are no short cuts. 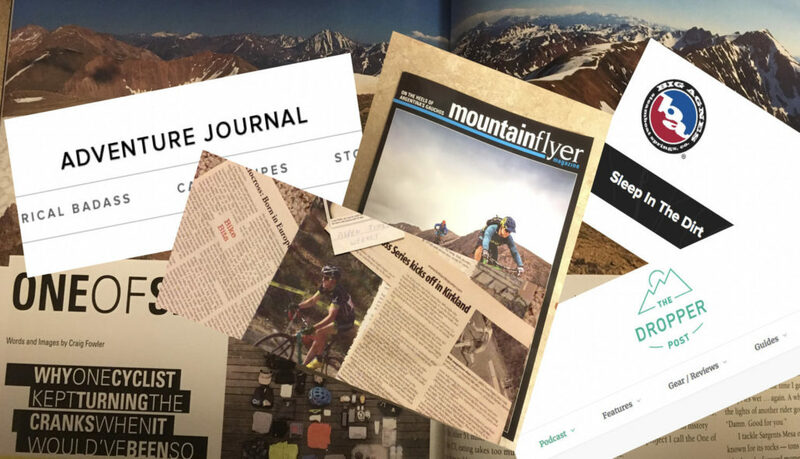 The more information you have at your finger tips the better your chances are you’ll finish your AZT thru-bike. Trust me when I say don’t let the lack of proper planning keep you from finishing your goal. It’s my hope the information on this page and accompanying pages will help ensure your success. Whether you’re racing or touring you need a plan when it comes to where to find water and food. My options for resupplying on the Arizona Trail came from the Guthook app (Atlas Guides) and two very helpful individuals who knew the trail very well. 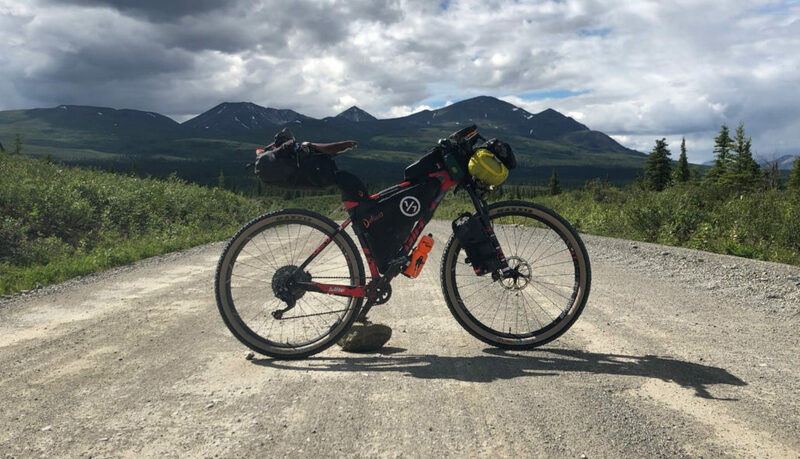 If you don’t have the luxury of someone who knows the trail as I did, I feel your best sources are the Arizona Trail Association, Guthook, and Bikepacking.net’s forum. There is also a Facebook page for the AZTR. There are many water sources along the AZT but those I have listed below are the ones that are (in no particular order): reliable, clean, and either on the trail or very close. There were only a few times where I needed more water. I thru-biked in the Fall so certain water sources dry for me may be flowing in the Spring. There are many more seasonal water sources and cattle tanks located between the sources I have listed. 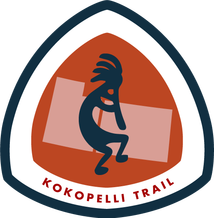 They can be found on the Arizona Trail Associations website and the Guthook App. Both are amazing resources and shouldn’t be overlooked, but there are some pitfalls (see tip to right). Let me be very clear about something here. As I stated there are more sources available. With that said most are nasty cattle tanks or dry pools of standing water. Even with my filter I avoided these at all costs. You might feel differently about them or there maybe more seasonal options when you decided to do the trail. My water capacity was five liters. IMO you should have at least six. But how much you carry and where you get your water is ultimately up to you. Next time I would have a larger fanny pack or slightly wide frame bag. Lastly, be sure to test your set up with full water, gear, and food before you go. Keep in mind the towns listed on the ATA website represents the hiking route and the bike route on Guthook is different from the official race route. So if you look at a list on either you have to make sure it’s on the actual race route and also adjust the mileage. This spreed sheet is available on Google Docs, Please go to “File”, then select, “Make a Copy”. Then make all the changes you like! Happy planning and trails. Like with the water resupply list above, there may be more resupply points along the route. 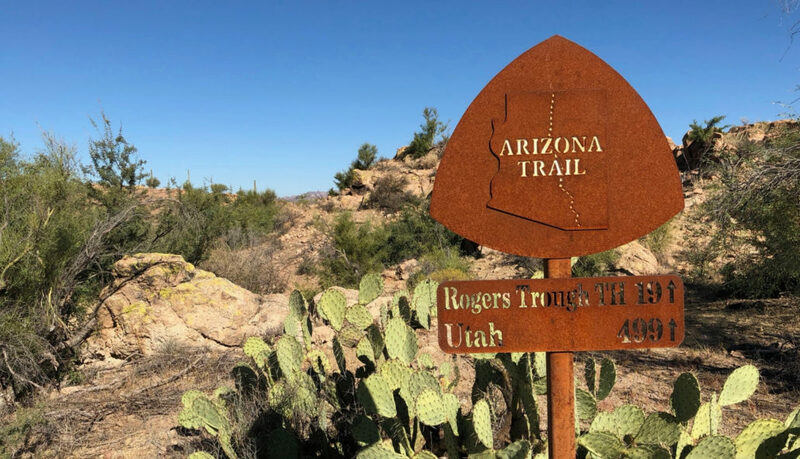 You can find more information on what services are available in the towns above on both the Arizona Trail Association website and the Guthook App. But not to repeat myself both are great resources, but there are some pitfalls as mentioned above in the Pro Tip, in the water section. 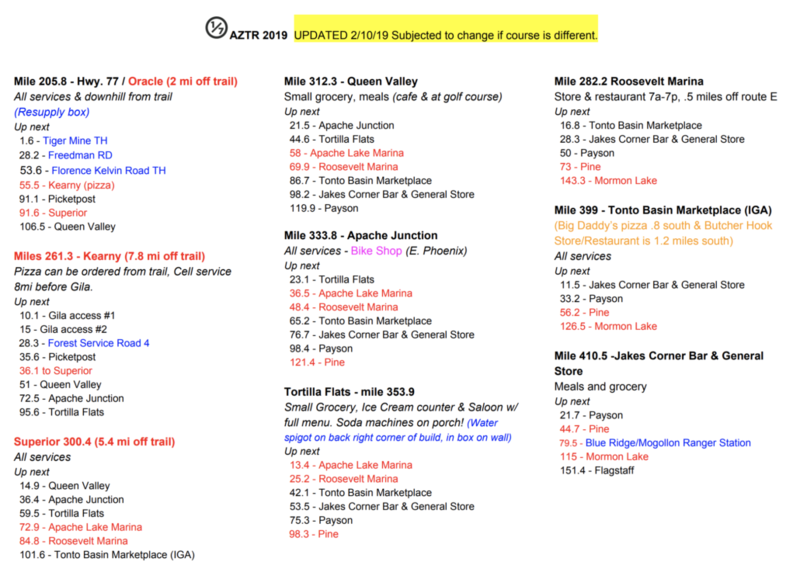 I never had any issues resupplying on the Arizona Trail (AZT) with the options available to me on the trail. If you do your homework you shouldn’t either. My only issue was having enough space to fit the food. Consequently, the furtherest I went without a resupply was 106 miles from Pine to Flagstaff. Even still I rolled into Flagstaff with left over food. I can only suggest you make sure your set up offers ample storage. 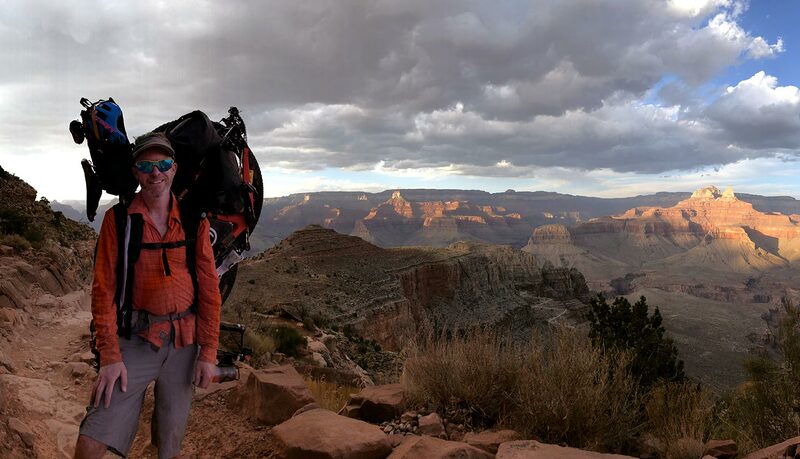 Where to ship your Grand Canyon gear. The PO is located at: 100 Mather Business Ctr, Grand Canyon Village, AZ 86023 next to the Canyon Village Market and Chase Bank. 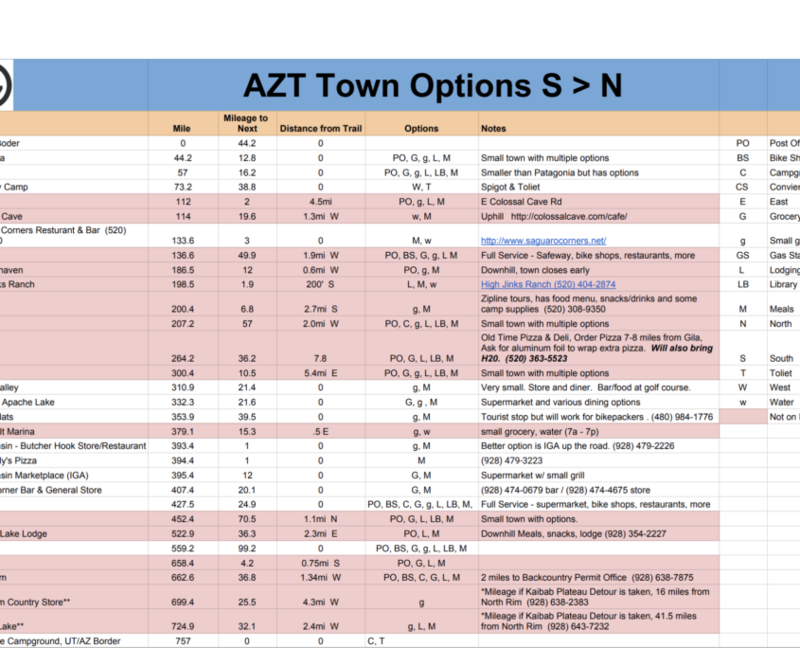 Feb. 13, 2019 – I have updated the 2019 AZTR Town List. It now includes updated mileages and there is also a AZTR 300 specific version as well. 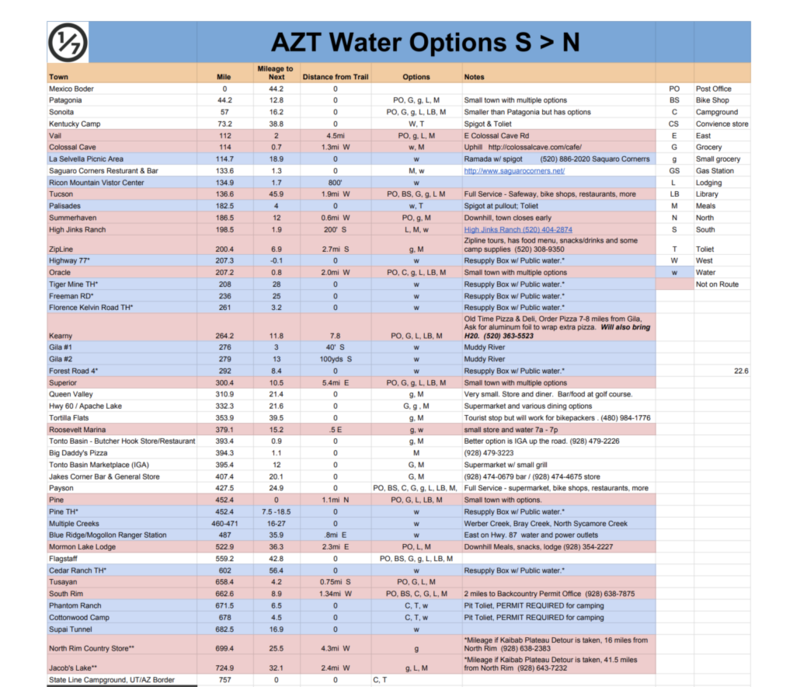 I combined both the Water and Town list to minimize what you needed to carry on your race/tour. I included additional clues and important phone numbers to key resupply stops that should prove useful. A day didn’t go by that I didn’t use my own simplified version. Second to your bike this is probably the most important item of your whole race/tour. Unlike gear, too much information won’t be a burden on you. 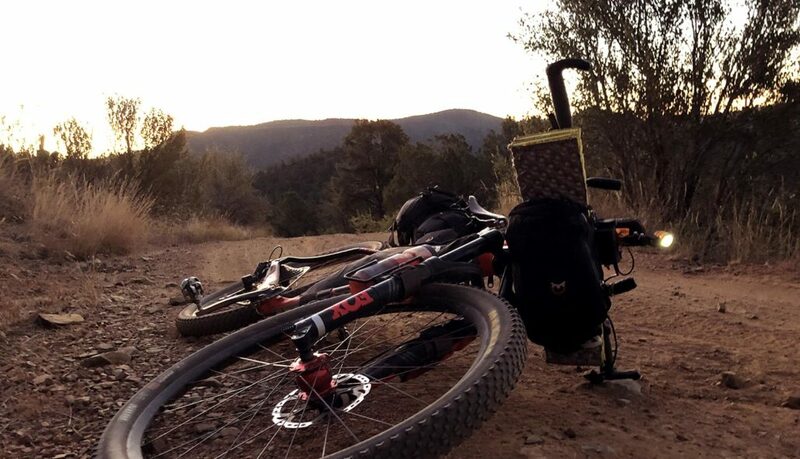 If you’ve done any bikepack racing or even touring you know that things can get physically tough out there. But they can also get mentally tough too. When we get tired even our minds slip. Have your resupply information organized and written down so you can access it without a fuss. Consider printing out a copy and also save a copy on your phone as a PDF. 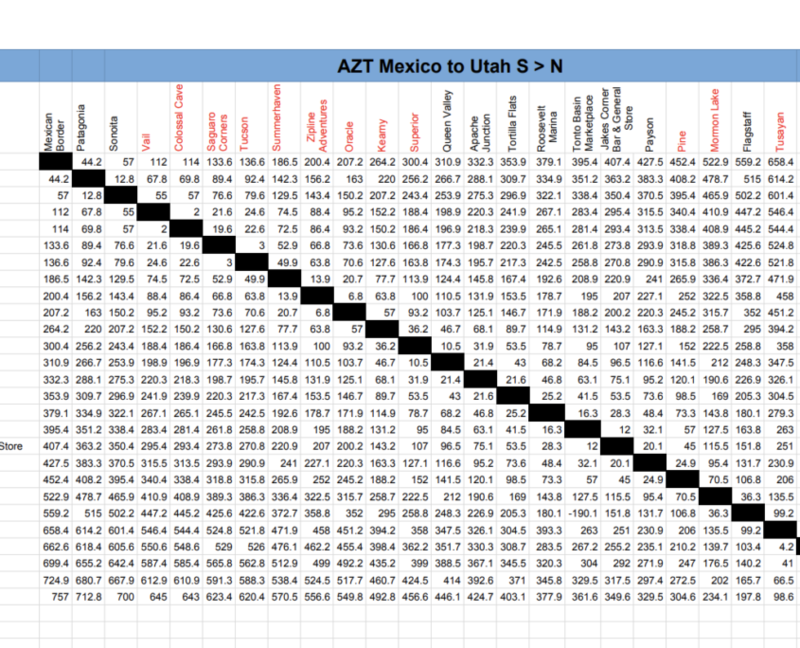 You will use this sheet more than anything during your race/tour of the AZT. Whether you’re racing or just touring the AZT you should have even a simple itinerary. The chances you’ll stick to it are slim but every trip needs some sort of referencing point. An itinerary is a good way to stay grounded and at times remind you of what your original goals were. 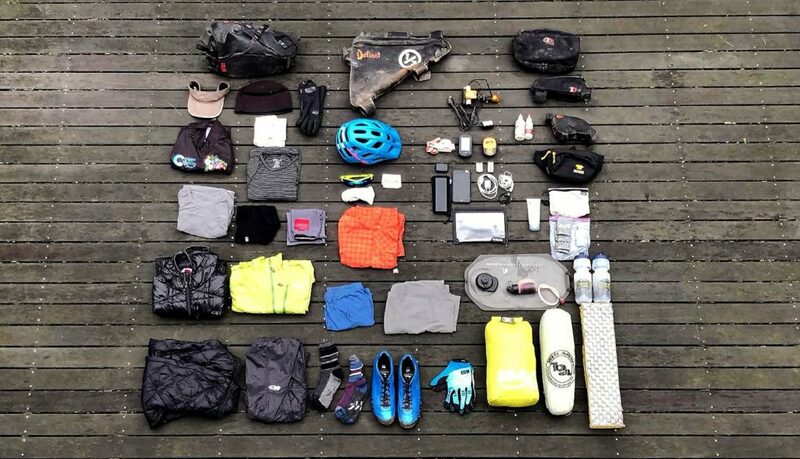 In my post, “Bikepacking, pre-trip considerations“, I go into detail on Itineraries. It also covers many other subjects from general planning, gear needed, to health and personal considerations, and electronics. Lastly, it even has things to consider in regards to what happens after you’re done. You might also want to checkout the Arizona Trail Association’s page for mountain bikers. They have some good links. The most noteworthy is the the MTB Data Book, but one must a member to view and download. The Data Book is filled with information to assist in planning your itinerary and resupply list. A big part of setting up an Itinerary is knowing what’s available and how difficult something is. The Passages pages on the ATA website are full of useful information. Going through them could be beneficial. 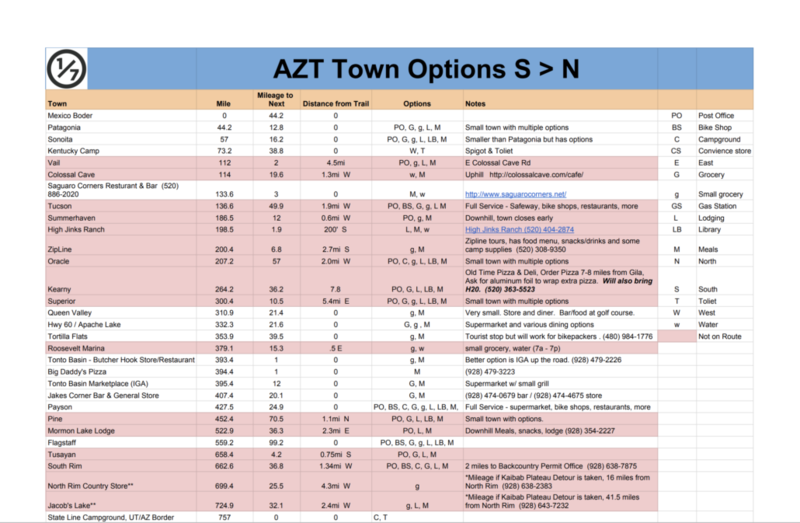 I put together mileage charts for both directions that will tell you the mileage between any of two towns on the Arizona Trail. So whether your a racer looking to figure out how much food you need between towns or just looking to find a short tour, this chart will have the answer. This spreadsheet is available on Google Docs, Please go to “File”, then select, “Make a Copy”. Then make all the changes you like! Happy planning and trails.